Today's Top Trending ETFs: Let our SmartScan and Trade Triangle technology, brought to you courtesy of our premium service MarketClub, instantly rank today's top trending ETFs for you. This complimentary list will update throughout the day to highlight the most timely trading opportunities. 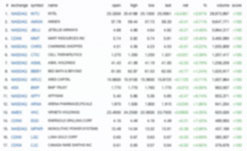 By filling out the form, you'll receive instant access to Today's Top Trending ETFs list and other trading resources from INO.com. Trading up +0.155 (+1.11%) at 13.795. Chart indicates a counter trend rally is underway The current up-trend could be changing and moving into a trading range Sidelines Mode. Trading down -0.030 (-4.05%) at 0.420. Chart continues negative longer term. Look for this market to remain weak. Strong Downtrend with money management stops. A triangle indicates the presence of a very strong trend that is being driven by strong forces and insiders. Trading up +1.48 (+0.91%) at 168.77. Chart confirms that a strong uptrend is in place and that the market remains positive longer term. Strong Uptrend with money management stops. A triangle indicates the presence of a very strong trend that is being driven by strong forces and insiders. Trading down -0.52 (-0.39%) at 135.42. Chart shows the current downward trend is at a crossroads and has possibly ended. Look for choppy trading action in the nearterm Very Weak Downtrend with very tight stops. Trading down -0.900 (-0.41%) at 222.000. Chart is showing some near term weakness. However, this market remains in the confines of a longer term Uptrend with tight money management stops. Trading down -0.0058 (-0.81%) at 0.7056. Chart confirms that a strong downtrend is in place and that the market remains negative longer term. Strong Downtrend with money management stops. A triangle indicates the presence of a very strong trend that is being driven by strong forces and insiders. Trading down -0.00025 (-0.01%) at 3.75000. Chart is showing some near term weakness. However, this market remains in the confines of a longer term Uptrend with tight money management stops. Trading down -0.0005 (-0.00%) at 29.8385. Chart shows that negative longer term is strengthening. The market action could signal the start of a major trend change Weak Downtrend Very tight money management stops. Trading up +0.08 (+0.41%) at 19.75. Chart confirms that a strong uptrend is in place and that the market remains positive longer term. Strong Uptrend with money management stops. A triangle indicates the presence of a very strong trend that is being driven by strong forces and insiders. Trading down -0.92 (-2.11%) at 42.70. Chart confirms that a strong downtrend is in place and that the market remains negative longer term. Strong Downtrend with money management stops. A triangle indicates the presence of a very strong trend that is being driven by strong forces and insiders.